dellorto 21mm phbg ds race edition for racers of course. 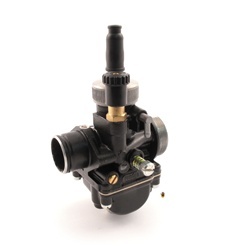 race edition features black powdercoating, metal float bowl, quick access jet changing bolt on bottom of float bowl, screw off carb top (versus two screw removal on regular edition), and an official certificate that you are a 'racer'. sick. race edition uses rubber coupling mount, clamp edition is available but only in non race edition, bummer. perfect for kitted motobecane, puch, peugeot, minarelli, garelli, sachs mopeds etc. found on numerous motorcycles and scooters as well - check your manuals, do some research. polini 50, husky 50, ktm 50, vespa, ya ya. Does not have a vacuum port as described - everything else is true stuff.